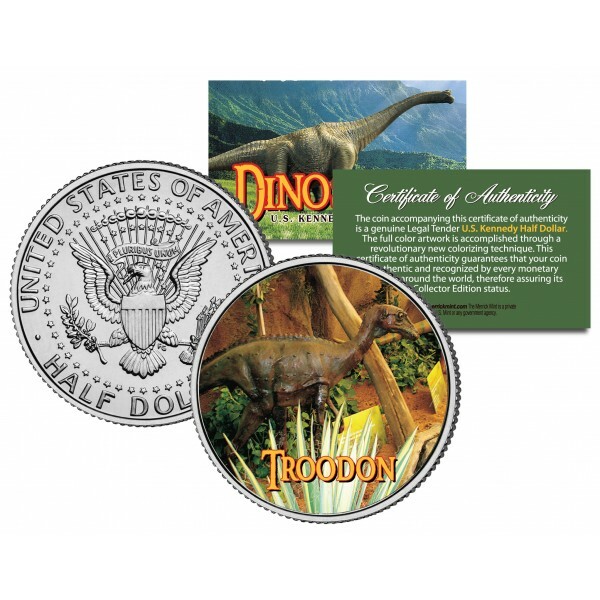 This COLLECTIBLE DINOSAURS SERIES – TROODON coin is a treasured collectible, combining the popularity of dinosaurs with coin collecting. Here is your chance to own a beautifully colorized JFK Kennedy Half Dollar U.S. Coin. This high-quality genuine Legal Tender U.S. coin has been colorized using a unique painstaking multicolor authentic process. Colorizing coins involves the unique application of special inks directly to the surface of a coin that achieves a level of detail, color saturation, and durability that is #1 in the coin industry. 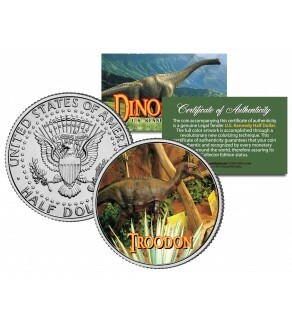 The result is an everlasting colorized coin collectible of ultra-high quality. 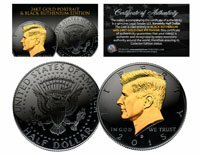 Each coin comes in a premium coin capsule with a Certificate of Authenticity to guaranty that your coin is authentic and recognized by every monetary authority around the world, assuring its Collector Edition status. Troodon is a genus of relatively small, bird-like dinosaurs known definitively from the Campanian age of the Cretaceous period.